I've been looking forward to Mattertags going live and now that they are, I am ready to pick your brains. I know that Alibaba did a VR store option, and that's nice, but what I am interested in, is creating the Virtual Shopping experience for boutiques using Matterport and the Mattertags. The obvious solution would be to create a link in the mattertag for each item that links directly to that product's page in an online store, but I'm afraid that some shoppers would not be savvy enough to return to the 3D showcase after opening their first item and it would break the experience by being too clunky. Basically, the goal is to keep the experience smooth, enjoyable, and contained in the same window and then handle checkout through a true e-commerce solution. I am pretty sure we all have a large pool of potential clients for this type of service if it’s possible to do it right. I dont think so - there is what I believe to be a 160 character lenght. I guess what it would come down to is what framework are mattertages built on, and in that language there is a section of code short enough for a quantity/add to cart function, AND Mattertags would execute the code rather than just displaying the text. I wonder if a URL shortener would help? I know it only works with "http" and "https", but I'm wondering if you can use a URL shortener to pull off a longer expression. I'm more of a designer & UX person than an actual programmer. I can reverse engineer enough to be dangerous, so for those of you who speak code as a first language, I apologize if these questions seem silly or elementary. 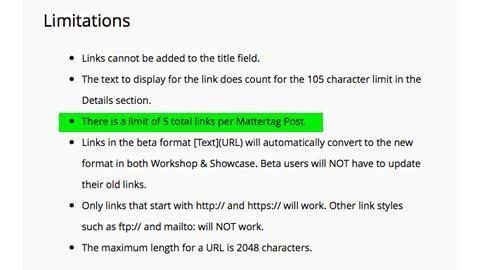 I don't know if you are aware that you can only have 5 mattertag URL's in one model. Seems limiting to me. Oh! Per model. I thought you could put 5 links per tag. I missed that. Thank You!